Today is a day full of glory and joy. Congratulations to Chairwoman Shu-Ying Li finally fulfilled her sacred mission. In just two years, she has demonstrated her extraordinary potential and perseverance. She has traveled all over the world and added 11 new chapters for GFCBW. Following Shu-Ying Li’s footstep is our upcoming 10th chairwoman, Alice Liu. Alice is not only the winner of the 2007 GFCBW Hua-Guan Award, but also an outstanding entrepreneur and excellent leader. Looking back at 2000, I joined this family of GFCBW. I won the very first Hua-Guan Award in 2001, and was the 6th Chairwoman from 2007 to 2010. I witnessed the birth and growth of GFCBW since day 1 as today we have established 65 chapters from all over the world. This success wouldn’t have come by if it weren’t for the great leadership from all our honorary chairwomen as well as the hard work and unity of all our GFCBW sisters globally. All our sisters watered and irrigated in this beautiful garden of GFCBW and spent countless time, energy, as well as money. All efforts have finally made GFCBW an outstanding non-profit organization, and each and every member of GFCBW should feel very proud! Alice Liu, who is inaugurating as GFCBW’s 10th chairwoman today, is a successful entrepreneur who started a business from scratch. Once you get to know her, you can see her unyielding and persistence personality under her beautiful ladylike appearance is what made her so reputable today. In 2000, she founded Avalue Technology, which mainly focuses on single-board computer and industrial systems. Avalue Technology was officially listed in Taiwan on June 8, 2010 as it went public. Alice’s achievements in her career are truly remarkable and admirable. 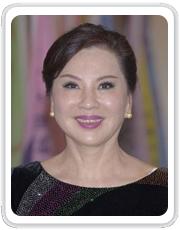 What is commendable is that even after she won the 2007 GFCBW Hua-Guan Award, she continued to spare no effort in GFCBW’s charitable contribution and participation. Alice had also served as the president of the Hua-Guan Award, and it was no coincidence that she is well recognized and supported by all GFCBW’s sisters. [Learn with growth, exchange knowledge, resource sharing, shaping leaders] Assisting the government in expanding national diplomacy has always been the philosophy and value of Global Federation of Chinese Business Woman. In the next two years, under the leadership of the chairwoman Alice Liu and her management team, it is believed that GFCBW will take its growth and achievement to the next level. Our sisters worldwide will continue to unite and bond in this garden full of intellectuality, sensibility and happiness. We will let the world rejoice in the presence of GFCBW!